See The Show? Read the Comic That Started it All! 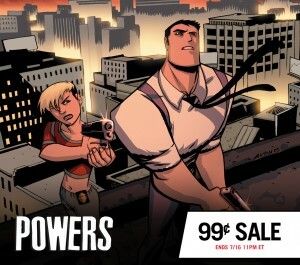 Don’t Miss the POWERS DIGITAL COMIC SALE! Today, the blockbuster Playstation Network Original Series POWERS comes home on Blu-Ray and DVD! Celebrate the release of the complete first season with the comic that started it all. Starting today, Brian Michael Bendis & Michael Avon Oeming’s Eisner Award winning comic series POWERS is on sale digitally through comiXology! Shop the POWERS DIGITAL COMIC SALE/strong> Now! Now is your chance to be part of the smash hit series from the very beginning. Every issue. Every case. Every moment. But get it while you can! The POWERS DIGITAL COMICS SALE ends 7/16.